Just how healthy is Sushi? 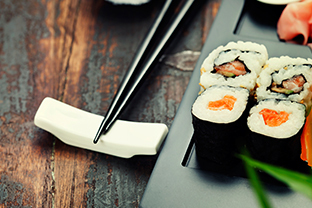 If you’re planning for a healthier new you, sushi, with all its vitamins, nutrients and fatty acids, could play an extra tasty key role. For many of us, the idea of a balanced diet and regular exercise sounds like hard work, but that’s only because you’re not doing it right. Exercise can be fun. You don’t have to spend 30 minutes pounding up a steep gradient on a treadmill. And likewise, eating healthily is not all broccoli and kale smoothies. Thanks to sushi and all manner of other wonderful foods, being healthy does not have to be dull. The beauty of sushi is that it’s so readily available, making it a lunchtime favourite among workers and a dinnertime staple for sushi delivery addicts. But scientists believe sushi is much more than just a convenient meal. Why are the Japanese so healthy? On average, the sushi heavy Japanese diet of raw fish, crunchy vegetables and fibre-filled rice contains only 30 percent fat, most of which is of the healthier polyunsaturated variety. So, it’s hardly surprising the Japanese are considered to be some of the world’s healthiest people. The result of all this healthy eating is a rate of heart disease that’s amongst the lowest anywhere in the world, and a life expectancy that’s one of the highest. Some scientists have even suggested that sushi could go someway to protecting smokers from lung cancer. If we take a look at the ingredients you’ll find on a typical sushi menu, it’s easy to see why this type of cuisine is considered to be so healthy. Fish is low in calories, specifically white fish like sea bass and red snapper, which have less than 100 calories per 100g. Even the richer red fish, like mackerel, eel and toro (a cut of tuna) have less than 200 calories per 100g. Then there are all those omega-3 fatty acids, which can help to prevent heart disease, arthritis and strokes. This staple of the Japanese diet is an excellent source of carbohydrates, and also provides a steady supply of protein. Rice is gluten-free, so it can also be enjoyed by those with allergies. White rice actually contains fewer nutrients than brown rice, but brown rice can block the absorption of iron and calcium into the body. You know the little splodge of green paste that accompanies your sushi meal, that’s wasabi, and it’s rich in vitamin C. It also aids digestion and has powerful antibacterial properties. If eaten regularly, Japanese scientists believe wasabi can prevent blood clots and aid cancer prevention. Now we’re talking. Seaweed is not only surprisingly tasty (go on, give it a try! ), it’s also highly nutritious. Nori is rich in vitamins B1, B2, B6, niacin and vitamin C, and it prevents cholesterol deposits from building in the blood vessels. As a general rule, the darker the seaweed, the better it is. Ginger root serves as a palate cleanser in your sushi delivery meal, and has been shown to aid digestion as well as helping the body fight colds and flu. It can also ease seasickness and flatulence, so if you’re on a date with a flatulent sailor, sushi delivery is definitely the way to go! And last but not least, this deliciously salty dipping sauce is made from crushed soybeans, which are high in protein, magnesium, potassium and iron. However, soy sauce is high in salt, so anyone with high blood pressure should probably go easy.